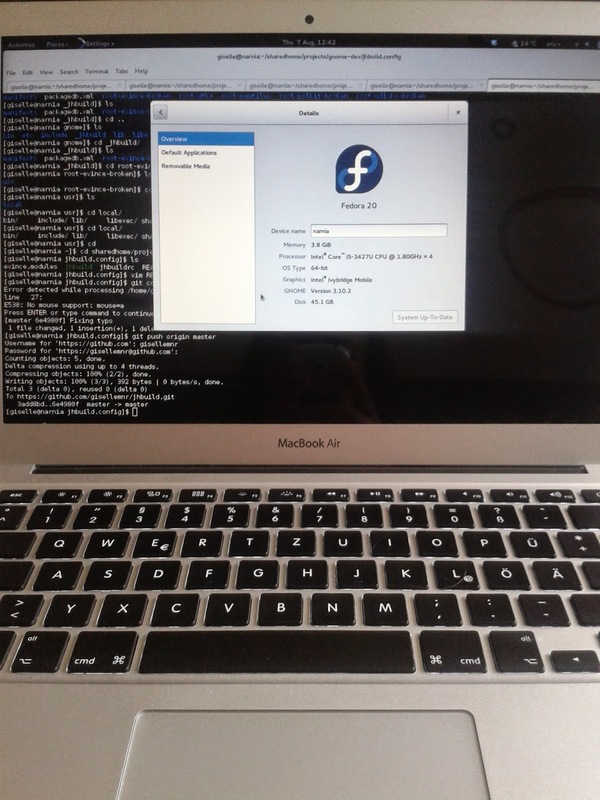 Apparently I don’t have enough projects on my hands, so I decided to install fedora on a MacBook Air to see if I can get the best of both worlds. I am sure you are thinking “are you crazy? OS X is the best system ever and you want to ruin it?”. Well, I’ve seen people install window on macbooks, so much for crazy huh? Jokes aside, I have tried using OS X. It is indeed an awesome system, but nothing beats Linux for programming for me. Especially since I have started contributing for gnome, I could not really consider abandoning Linux for good. So I have two laptops, one old sony vaio with linux where I do most of the work and a fairly new macbook, that works like a charm, is quiet and has a battery that lasts forever which I use for… presentations… videos? sometimes… hmm I tried programming, but installing the tools is annoying and the terminal is kind of slow. I wondered for some time (too much time!) whether I could join forces and have a decent running linux on the macbook. I even installed a virtual machine with debian to see how it goes. It worked well, but a virtual machine is not a machine, and it was eating the battery up. In the end, I was too afraid of going through the process of partitioning disks on some non-standard hardware and messing up a perfectly functioning computer for good. (Yeah, I know this would not happen, but I wouldn’t want to spend a week trying to fix stupid installation mistakes). Reboot the computer with the usb connected.